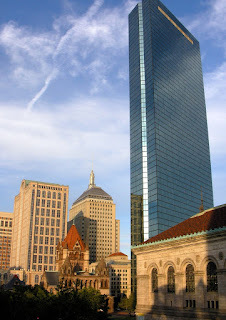 Hi all, I just got back from a weekend in Boston with three "girl"friends: Jan, Carrie, and Jaclyn. We had planned on four days and three nights, but got robbed when our 6:30am Northwest flight out of Detroit suddenly got cancelled. I could rant on and on about the complications this caused us, but suffice to say that we all had different flights (on other airlines) throughout the day and I didn't end up at our hotel until 11:00pm that night. As a result, we lost an entire sightseeing day. The "official" explanation now that we are home is that there was bad weather the night before. If that's true, why were all the other airlines not cancelling their flights? Boston was very crowded with tourists, which may be typical of most summer weekends in most large cities. Everywhere we went it was wall to wall people. I think for that reason I didn't enjoy Faneuil Hall and Quincy Market as much as I had hoped. I would go to these places again at a different season and very early in the morning, also to do the Freedom Trail more thoroughly. We did feel somewhat rushed, because of our abbreviated sightseeing time. We wanted to do the Duck tour, but alas it was sold out so we decided to try the "new" Super Duck Excursions. The vehicles are newer, larger and possibly more comfortable, but that's all. One of our party had been on the original Duck tour and could offer a fair comparison. Our tour remained mostly on the harbor side of town and I felt we went in circles a bit. Our guide was not very entertaining. The guests on the original Duck all seemed to be laughing and having a better time. We did go in the water, but we didn't see much and I didn't think it was worth it. We all love eating out and wanted to experience a lot of different restaurants. We would go to one for appetisers, another for dinner, another for drinks or dessert. A highlight for me was the bar area downstairs at Legal Seafoods. I stopped in by myself when I was doing some solo exploring and had a great mojito and my first soft shell crab. It was sublime! Can't wait to return for dinner someday. I know this is a chain, but the quality seems to be there for sure. We had also ordered soft shell crabs at Lucca and it was nearly inedible. They were half of the size of the one at Legal and overwhelmed with thyme. Monica's in the north end was very good. Risotto with truffles, yum! Other memorable dining experiences were on Newbury Street: Tapeo, a tapas-style restaurant where we shared many wonderful small plates. My friends loved the Armani Cafe and the tempura lobster appetiser at Sonsie was the best thing I've had at a restaurant ever. 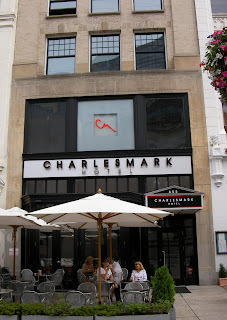 Since we were blessed with beautiful weather we dined outside or at the open front windows whenever possible. Great for people watching! We didn't hit Mike's Pastry because we were just too stuffed and the lines were out the door every time we passed. On a side note, at each restaurant we had an incredibly good looking waiter. They probably fought each other for our table since we had two knock-out gorgeous young women with us. At Tapeo, the waiter actually sent over a free desert. One night we had tickets for "Sheer Madness", an audience participation comedy/murder mystery which was fun. We sat so close the actors could almost spit on us. It is the longest running play in North America. ("Mousetrap" holds that honor in London.) The ending of the play changes every night, depending on the audience vote. It is on Warrington Street, which our newbie cab driver simply could not find. We ended up paying him, getting out and hailing another cab which finally got us there in time. He was very sweet and apologetic and turned the meter off while he was circling trying to get his bearings. When a group of motorcyclists drove recklessly next to us, he was protective of us, calling us "my ladies". Sunday morning I attended church at the Old South Church just a few steps from our hotel. Members of the congregation have included Samuel Adams, William Dawes, Benjamin Franklin, Samuel Sewall, and Phillis Wheatley. In 1773, Samuel Adams gave the signals from the Old South Meeting House for the "war whoops" that started the Boston Tea Party. Another historical church in Copley Square is Trinity Church, reconstructed in 1872 after a fire. 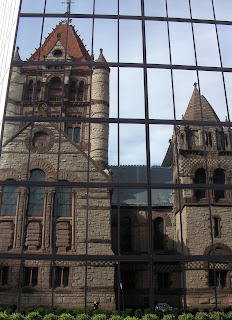 Here is my photo of the church reflected in the glass facade of the John Hancock Tower next door. There is so much to do in this city, I am hoping to be able to return soon.